Nothing says Christmas for a cat owner more than finding your cat attacking your Christmas tree. While, to us humans, the Christmas tree is a beautiful decoration meant to be admired and gathered around, to a cat it’s a completely different story. For a kitty, your tree is basically a giant toy with more toys hanging from it–a.k.a. your precious ornaments and decorations. 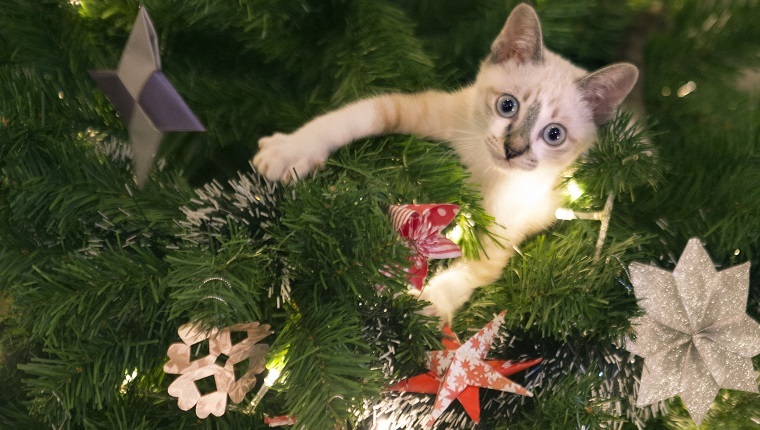 Here are ten adorable videos of cats climbing, attacking, and ruining Christmas trees. And of course, we should all make it a priority to always be sure our cats are safe around the Christmas tree. Even though these videos are cute, let’s all keep our kitties safe this season. This Calico kitty named Izzy has turned this family’s Christmas tree into her official home. According to the owner, they cannot hang any Christmas ornaments because Izzy immediately goes after them. Izzy even loves to sleep in the tree like it’s a cat condo. Izzy is the reason that this Christmas tree doesn’t quite look the way a Christmas tree is expected to look, as she even knocks off all the lights at the very top! This owner decided to secretly record his cat with a time-lapse camera because, whenever he came home, it seemed that the Christmas tree had been attacked. When he’s home, his cat plays it cool and does nothing suspicious. But as soon as he leaves, it’s a different story. The cat first checks the window to make sure his owner left, and then instantly makes his way to the tree for his attack. Now that is one smart and stealthy cat, but he’s officially been caught red handed–er, red pawed! Before the Christmas tree is even finished being put up, these cats are on the attack. As the owner is setting up the tree the cats cannot stop themselves from getting in on the action. While the cats might think it’s all just fun and games, they probably don’t realize they are more of a burden than a help. They start jumping in the tree and pulling off all the decorations. But you have to admit, it’s adorable, right? Thinking about putting tinsel on your Christmas tree? Well, think again because tinsel is seen by cats as the ultimate cat toy. It’s shiny, fuzzy, and when it moves it’s irresistible to a cat. This owner attempts to decorate his tree but the tinsel is just too much for the cats to handle. After watching this video cat owners might want think about skipping the tinsel or it will end with disastrous results. If tinsel is swallowed, it can cause obstructions and lots of nasty problems. However, from the cat’s perspective it’s the most fun decoration ever. Watch this compilation to see the most classic cat Christmas tree fails. If you are a cat owner, you might recognize a few of these fails from your own home. After watching this video it seems as if maybe all cats were born with the instinctive desire to attack Christmas trees, no matter what. It’s such a common thing between all cats that Christmas trees truly never had a chance. Fact: Yuri the Siberian Cat loves to climb. She loves to climb so much that she climbs all the way to the very top of the Christmas tree. It’s amazing just how fast she is able to get to the top. Make sure you watch until the end because it’s adorable how she just sits comfortably at the very top of the tree. She even looks like she could be a cat Christmas ornament! In this video we have another case of the tree climbing cat. This cat however makes it all the way to top, becoming the Christmas tree star. The owners already had to remove all the decorations because this naughty kitty has made a habit of climbing the tree and knocking them off. While he is a naughty cat, you have to admit he does have amazing skills to be able to sit at the very top and not fall off. You would think the angel at the top of your Christmas tree is safe from the threat of cat attacks far above the ground, but think again because nothing is safe! The power of the cat attack is strong enough that even your precious angel cannot escape. Watch as this adorable kitten makes it all the way to top just to attack the angel topper. If you have cats, especially kittens, you might want to invest in an inexpensive angel topper just in case your cat finds their way to it. This cat is crazy about Christmas. He can’t stop attacking the same Christmas decoration over and over. It’s like he is on a mission to take it down, and nothing will get in his way. He is one determined kitty. According to the owners, he is usually a very well behaved cat, but something about the Christmas tree brought out the naughty in him. In this short but hilarious video, the cat uses the Christmas tree as his own personal hideout. One moment he is just sitting innocently in front of the tree minding his own business, and then, in the next second, he’s gone! Hopefully this cat is not up to something under there. If you look at the tree you wouldn’t even know there’s a cat hiding inside. Do your cats attack your Christmas tree? Let us know in the comments below!